Fall is a season where many of us head out to enjoy the outdoors. Crisp air, colorful leaves, deer in rut, and clear mountain streams lure us to nature. 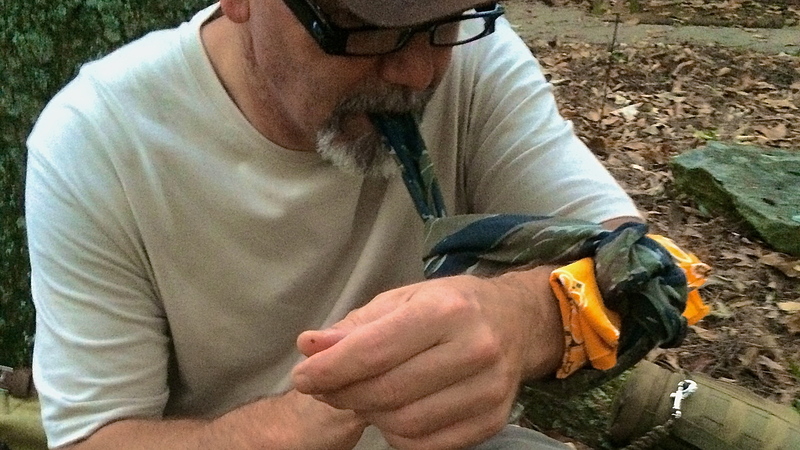 Unfortunately, there are times when things go sideways on day hikes and canoe trips. When they do, you’ll need knowledge, skills, and resources to get home safely. 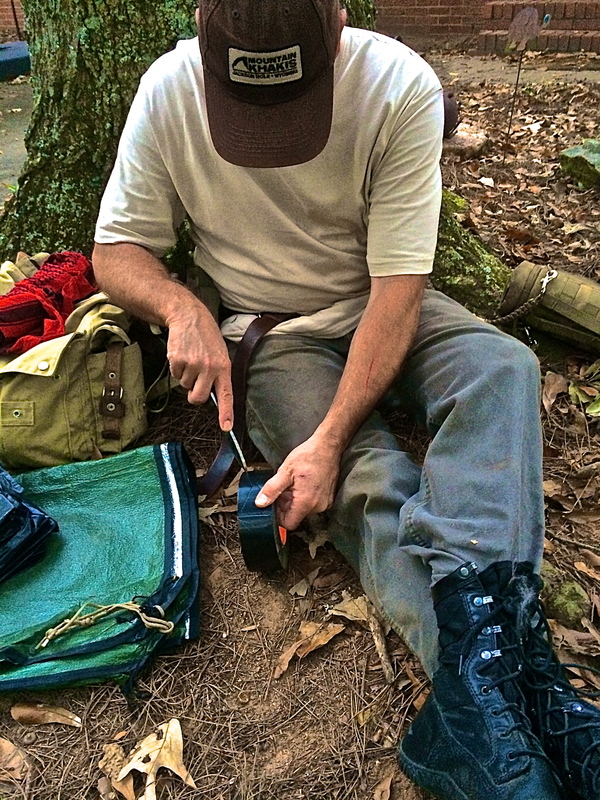 The goal of wilderness survival is simple… to effect self-rescue or be found alive. Even “minor” injures in a 72 hour scenario can decrease your chances of meeting that goal. Self-aid should become a top priority on your skills list. Why? You may choose to carry a first-aid kit to treat these injuries. That is a smart option. Let me state upfront, if you require daily medication for health issues, by all means, be sure to pack enough of your meds. Can your 10 piece kit double as a self-aid/first-aid kit? Indeed it can! 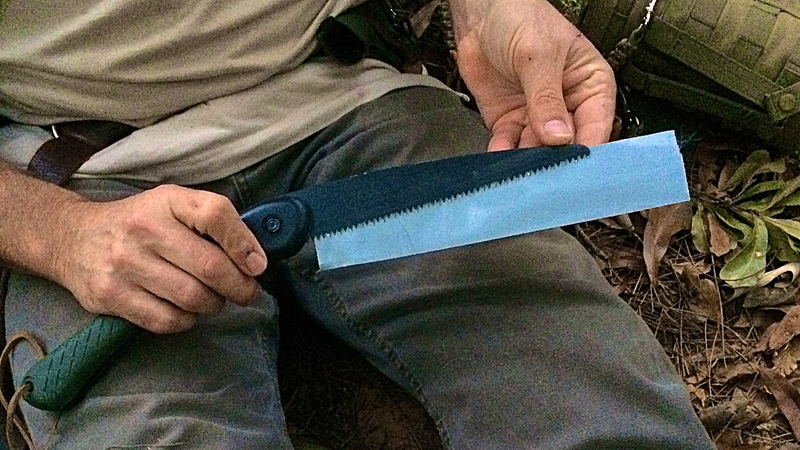 Look beyond the obvious uses for these 10 items – shelter, fire, navigation, water, etc., etc. 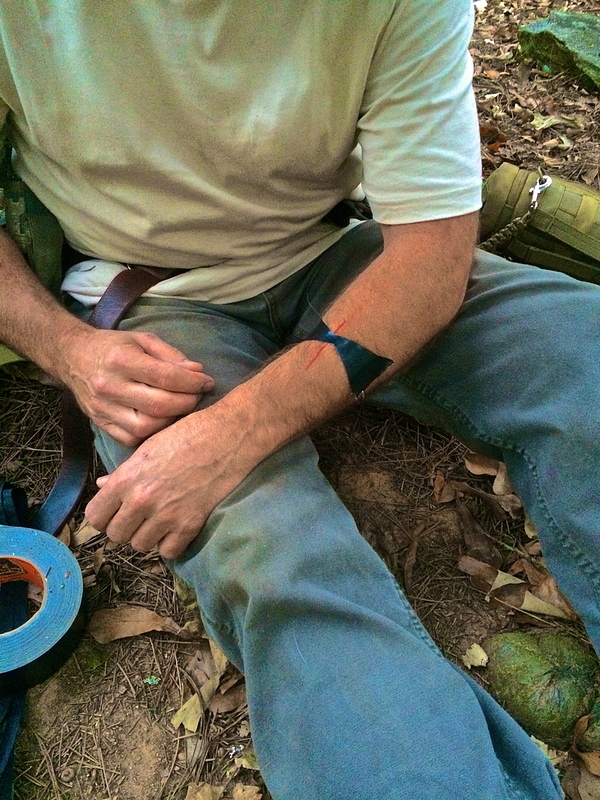 With a little creativity, your 10 C’s can effectively treat each of the most common injuries in a 72 hour wilderness survival scenario. Using your knife to cut a duct tape butterfly bandage. Keep your knife outside the Triangle of Death. You don’t need another wound. Pull the wound together after securing one side of the bandage to the skin. The cut should be pinched together slightly. This is a temporary fix. Shemaghs make great slings. Get one that is 100% cotton. 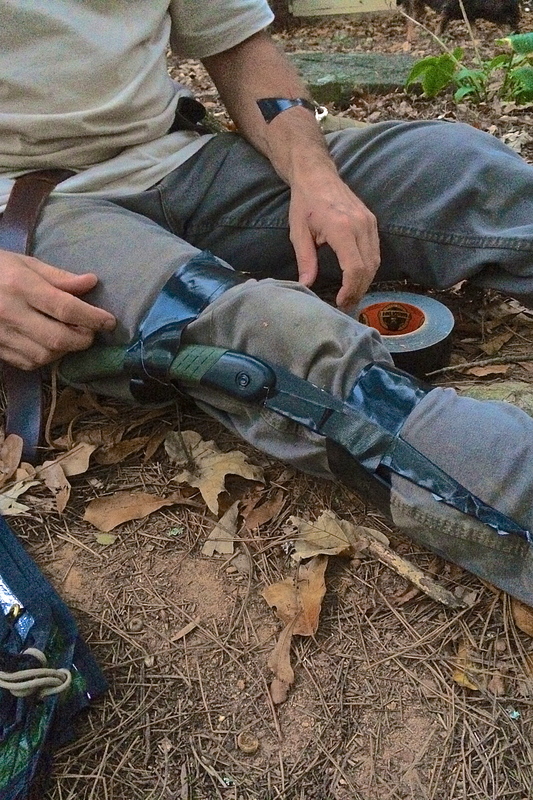 If using a folding saw or machete as a makeshift splint, tape the cutting edge before taping it to your limb. Immobilizing a limb. Add padding under your splint before taping. 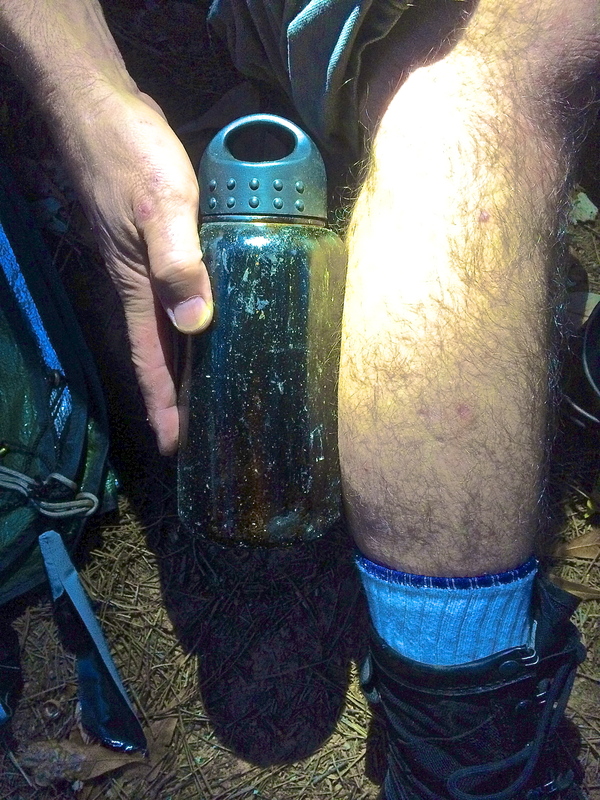 Container (water bottle) – cold compress to reduce swelling, irrigation – in the case of venomous snake bites, keep location cool, immobilize, and get medical help ASAP. 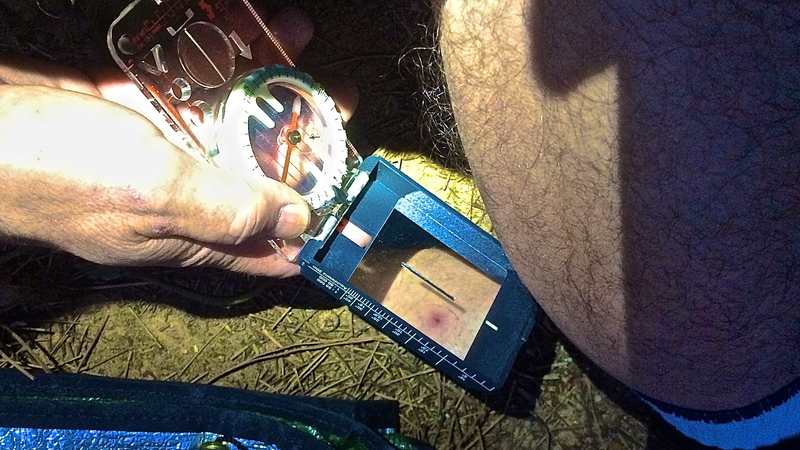 Sighting mirror on compass used to inspect embedded tick on the back of the calf in the dark. A headlamp frees both hands for the task. Your candling device (head lamp/flashlight) can be used for inspection and treatment at night with all the common injuries. Metal water bottle and cup is useful for preparing infusions, decoctions, and sterilization of your knife or needle before cleaning wounds. Besides using a tarp/emergency space blanket for core temperature control (CTC), these items can also serve as a stretcher, water collection device, and sling material. Use your pack for immobilization and elevating injured limbs and or dealing with shock. And of course, a proper fire kit affords you the ability to maintain CTC, heat natural medicinals, and heat compresses. 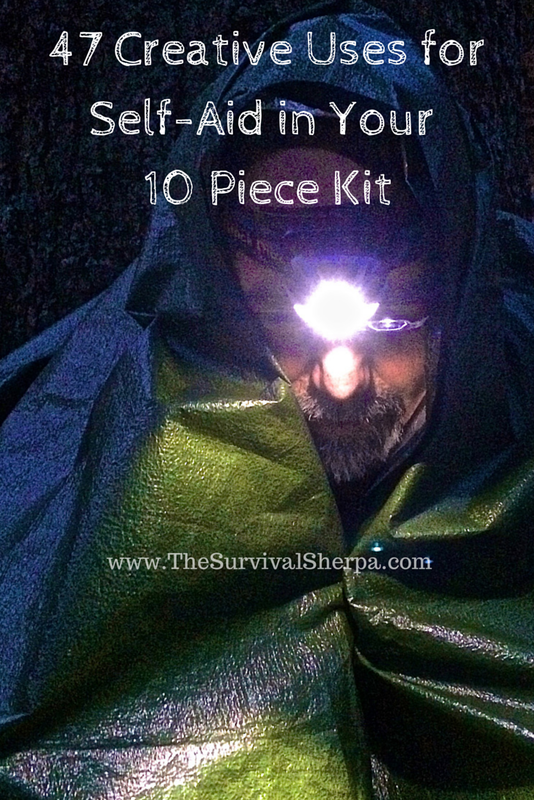 Your 10 piece kit should always accompany you on wilderness adventures. As you can see, these multi-purpose tools have many redundant uses. 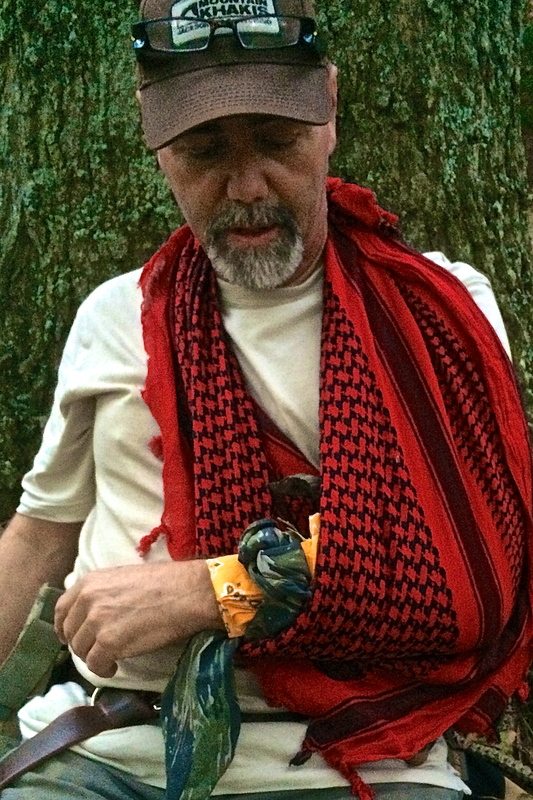 Heck, the 10 C’s of Survivability should go with you no matter where you’re headed. Awesome! We would have all liked to have gone to pathfinder school Thank you so much for passing your knowledge on and playing your opportunity forward!!! Thank you, Homer! That was by far the best weekend I’ve had in a long time. The folks there were very knowledgeable, approachable, and of like mind! If you ever get the chance to attend, you won’t be disappointed, brother! Great post! Lots of info! You’d love it, man! We’re not too far from each other. We need to get together! Great list Todd, I love that saw splint! Something else for duct tape (cargo tape) is that you could probably make a tourniquet out of it that worked a little bit better (because it is wider) than just cordage. You could probably use them together and make it even better. Just a thought. Only as a last resort would I apply a tourniquet of any kind. But a I’m sure the duct tape would do the job. Reblogged this on North Carolina Oath Keepers.